These smooth little strummers are crafted from gemstones inspired by each birth month. Play with the stones? You do it all the time. 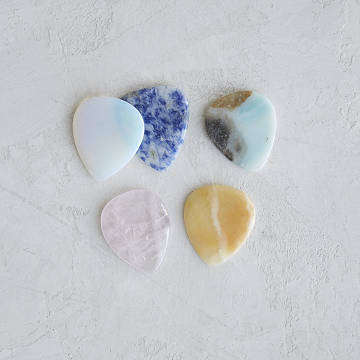 These guitar picks are crafted from gemstones inspired by each birth month, whether you're more of a September shredder or an April acoustic. The smooth little strummer makes a great gift for your guitar hero, or someone who just got their first real six string. Handmade by Dustin and Stephanie Headrick in Nashville, Tennessee. This is so pretty and much thinner than I thought it would be. That's a good thing since it's a plectrum (pick). I don't expect he'll use this for anything but practising or display. It's a bit expensive to take to gigs with the thought of possibly losing it. If the line running through the pick had not been the same way you have to strum it might not have broke. I feel we were sent a flawed pick and it should never ha e been sent to use. a beautiful stone would have been smother and perfect if it hadn't arrived broken was easily glued back together and smoothed out so it had no rough spots again. I would totally buy this again. Gave the pick as a gift. Always a great experience from this catalog. This was a gift for my favorite musician. It's my birthstone and his favorite color. I figured it'd produce some interesting tonal qualities over his standard plastic picks which is great considering that he loves to experiment. He was really excited! However within a few strums this pick split in two in his hands as he was playing. He says it's not a big deal, but I hate to have paid for something that isn't functional. If this pick isn't meant for actual instrumentation then the description for the item should be updated to reflect this. The color was nowhere near what was shown on the website. I'm not sure what kind of sound he will get with this pick or how comfortable he will find t when playing, but as an annual search for an unusual pick this was great! I can guarantee he will really enjoy experimenting with it.